Peeling beak of a parrot is a common sign, it’s natural and normal for most beak peeling cases. A parrot’s beak serves not only in eating, but also as a “hand” in climbing on the cage or tree branches. Like our nails, birds’ peaks are made of keratin and keep growing all the life time of the birds. 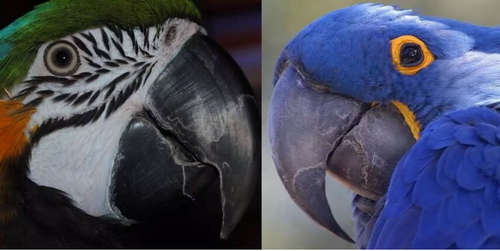 There is always the new beak tissue growth under the existing beak and cause the old outer of the beak is being sloughed off, this is the most common reason we see the flaky beak of a parrot. Actually you may see a parrot hurry the process of outer beak peeling by rubbing its beak against hard surfaces. Sometimes a poor diet will cause problems to birds’ beaks. Vitamin A deficiency and/or Riboflavin (Vitamin B2) deficiency may result in beak malformations and/or beak peeling. This is a problem that can easily be remedied by offering a variety of fresh foods and high quality multi-vitamins/minerals supplements. A good tip is to provide a piece of cuttlebone to your pet parrot for its beak grinding, this will not only for the parrot ‘s intake of calcium, but also help to prevent the beak from overgrowing. For the symptoms like broken beak with large pieces peeling off or serious deformed beak, the parrot owners are supposed to ask help from a vet immediately.